The Religious Education program at Our Lady of the Isle Parish, led by Ginny Gibbs, teaches the message of Jesus Christ through participation in Sunday Eucharist, Children’s Liturgy of the Word, Sacramental preparation, and weekly classes led by faith-filled and enthusiastic teachers. Students participate actively in the Church community by taking on roles as altar server, choir member, usher, lector and gift bearer. Students are invited to a deeper understanding of Christ’s love for us through seasonal events such as the Nativity play and Stations of the Cross and devotions such as the Procession of Saints and Marion Procession. Family Mass: Takes place on the first Sunday of the month, usually on Fellowship Sunday. It is a time for students to participate as choir members, lectors, greeter and collection ushers. Altar Servers: Students who have received First Communion should participate in Mass as an Altar Server. All eligible students, including those already on the schedule, will attend practice during class in September and October. 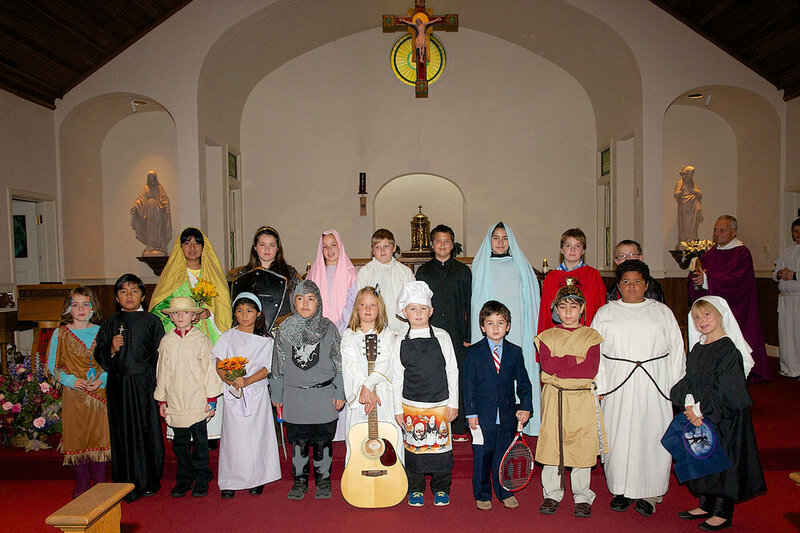 Procession of Saints: To celebrate All Saints Day, the students, dressed as a saint of their choice, enter Mass with Fr. Peter and share a bit about their saint. Students will prepare and gather information in class but are encouraged to study their saint further at home. Sacrament of Penance (First Reconciliation): The Sacrament of Penance and Reconciliation (Confession) will be offered to the students during class time. Those students who will be receiving the Sacrament of First Holy Communion this year will receive the Sacrament of Penance for the first time. Thanksgiving Day Mass: Students dress in their saint’s garb and participate as readers and ushers during Mass as they give thanks for the saints! Christmas Pageant: The youth of our parish perform in the Nativity Pageant on Christmas Eve. Marian Procession: To honor Mary, the young women and men of the Religious Education program offer flowers and prayers in devotion to the patroness of our Parish. For a complete description and guidelines of the Religious Education program, please click here.